As we know that we can’t buy health, therefore we have to earn it and work for it. My family and I are moving towards a healthier lifestyle be it in our daily diet, activity choices, purchases and hobbies too. So recently I replaced my old weighing scale to this new Medisana BS 430 Connect Body Analysis Scale. Why do we need body analysis scale? How body composition analysis can help us to stay in step with our health and fitness goals? Let’s find out the answer below. I think many of us including myself have the weighing scale that can only indicate our weight and that’s all. Do you know that weight alone is not a clear indicator of good health because it does not distinguish between the kilograms that come from body fat and those that come from lean body mass or muscle? If we have too high of a body fat percentage which is a condition called obesity, this puts a person at risk for many serious medical conditions including heart disease, diabetes and so on. For a more accurate assessment of our body, we should also include characteristics such as body mass, body fat, body water and bone mass. I would suggest we invest a body analysis scale at home. Not only for myself but the whole family can use it too as it can store data up to 8 users. An understanding and overview of your overall body composition will provide an insight into our well-being. Here is my new Medisana BS 430 Connect, a Body Analysis Scale with stainless steel electrodes and Bluetooth. It comes in a sleek design and in off white color that easily matches any corner of the house or office or premises. 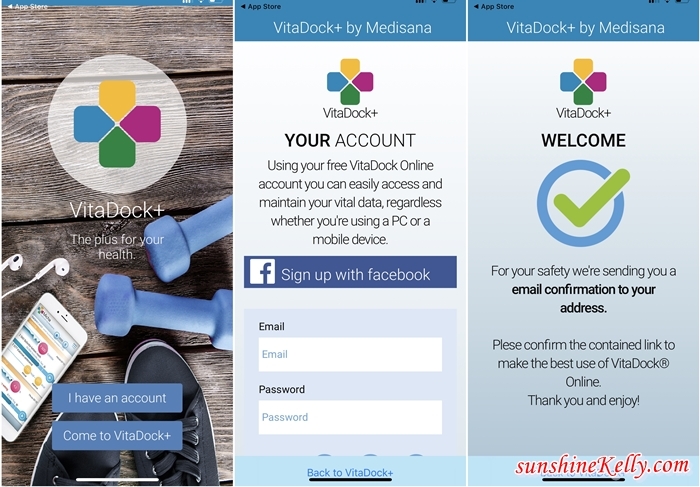 What I really like about Medisana BS430 Connect is that it not only delivers measurements for up to eight users which is great for my whole family and shows them on the large backlit display, but I can also transmit the data by Bluetooth® to the VitaDock app on iOS and Android devices and also to VitaDock® Online. 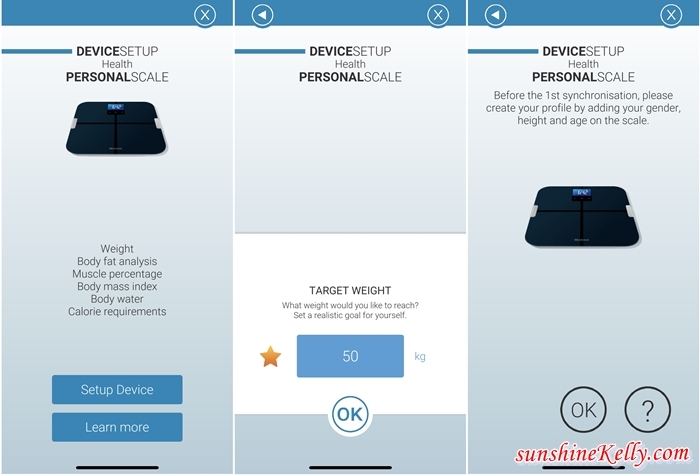 Of course, this body analysis scale BS 430 connect does measure more than just body weight. It detects by means of highly sensitive stainless steel electrodes their precise body fat, body water and muscle mass. The interplay of all of these values is a crucial element in reaching one‘s weight goals in a healthy way along with efficient fitness programs. The large LCD display with white luminous digits and bright blue backlight is easy to read even in poor lighting conditions. 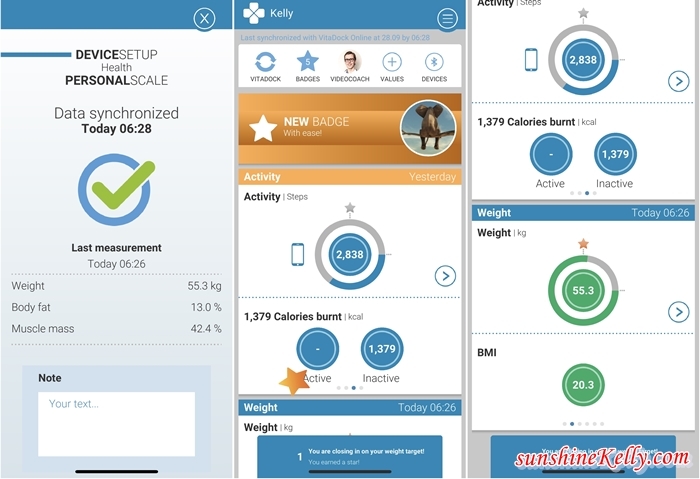 So now with this VitaDock App I am able to keep track of my weight, body fat, body water, muscle percentage and bone weight, determination of the BMI value and integrated calorie requirement analysis (BMR). I can also set my target weight which is 50kg and I am currently 55kg. 5 more kg to lose and hope that I can achieve it by end of 2018. Ganbatte Kelly! Besides this, I also can transfer my vital data results from my VitaDock App to VitaDock® Online and benefit from the numerous features to view and display my data in the online portal.